Bobcats and Knights fill up the Tamarack Beach courts in the fifth match of the season. The sand, the breeze and the net. Boys beach volleyball is a club sport affiliated with the students and staff at Sage Creek High School. The club is currently run by the club advisor, Sr. Krámar — who used to play volleyball in high school and college — along with two new coaches being added onto the club this year: Ryan McDevitt and Keaton Marks. 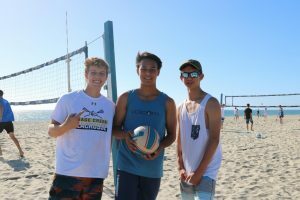 Seniors Jacob Blasquez, Zach Shubert and sophomore Jackson Gilbert pose in front of the courts at Tamarack Beach, during their game. The boys beach volleyball team has grown profoundly from last year and now has a current roster of 22 players on the team. This northern league (Carlsbad, La Costa Canyon, Pacific Ridge, Sage Creek, San Dieguito, and San Marcos) athletic club accepts all variety of grade levels at Sage Creek. As well, you “don’t have to be an expert at the game,” to join, club advisor Sr. Krámar states. Club practices occur commonly at the Tamarack beach, after school at 3:30 pm. These practices are monitored by the new coaches, Coach McDevitt and Coach Marks. They’re “both highly skilled players,” Senior Jacob Blasquez says. 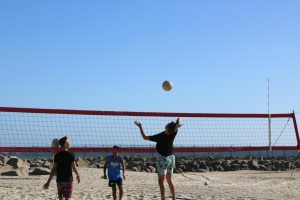 Senior Braden Brasher commented on his “love for the sport” and talked about his opinions on the team and how they’re, ”super solid and… make it really fun.” But what really is the sport of beach volleyball? In the top court, bobcats spike the ball against the Knights during the Knights v. Bobcats game. Beach volleyball is nothing like volleyball on inside courts, their only similarity is their objective. The sand is an intense obstacle compared to the solid hardwood floor that is the foundation of indoor volleyball makes players have to put in more effort to move around the court. The positioning of the teams along with transitioning from six players on each side of the court to two per side increases communication between each of the players. As well as a difference between the weight within the volleyballs to incorporate wind, all of the variations are what make the outdoor and indoor sports different from one another. The winner is determined by whichever team is able to reach 21 points, along with having a 2-point advantage within a game. Want to see the Bobcats in action for yourself? Come check out the upcoming games against other teams on Oct. 4, Thursday, to see the Mavericks v. Bobcats at LCCHS or their next match v. SDA on Oct. 12. 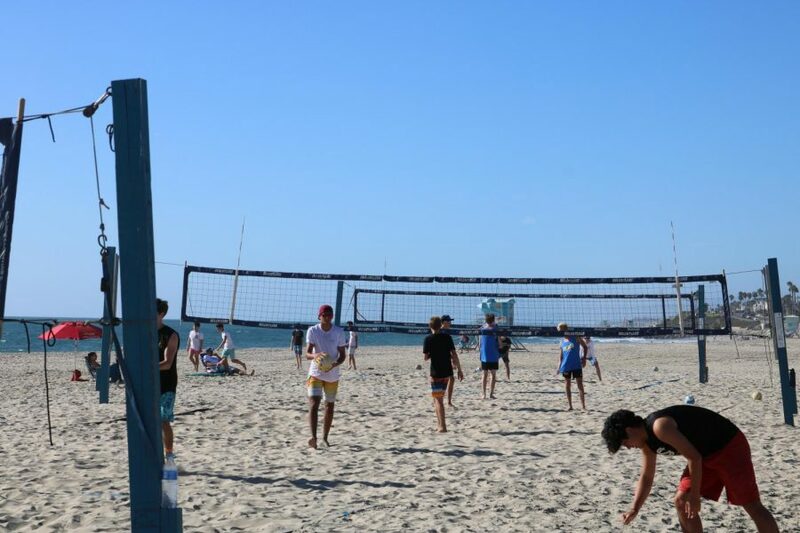 If you’re interested in joining boys beach volleyball but don’t know where to begin, you can start by talking to Club Advisor Sr. Krámar, and find out how to get involved in practices as early as possible. Awesome article Gabe! Thanks for featuring me! Boys Beach Volleyball is so much fun and it has been a really good experience for me! Spending time at the beach as well as having fun with friends is a win-win! If any of you want to learn how to play, come find me and I can teach you. Outstanding job Gabe! I like how you explained the difference of Beach and Indoor Volleyball because many people assume that they have the same rules. Nice photo by the way. P.S. I don’t know why I wrote this at midnight.